Tennis Ireland | Irish Blind Tennis Team to take on the world! Irish Blind Tennis Team to take on the world! 04 May Irish Blind Tennis Team to take on the world! Eight blind tennis players will make history next week as the first Irish Blind Tennis team to compete overseas. They will be participating in the International Blind Tennis Association’s Championship in Alicante, Spain. Playing against athletes from fifteen countries across Australasia, the Americas, and Europe; the team will take on well-established nations such as Japan, where the game originated in the 1980s so they’ll have quite a challenge on their hands. Blind tennis is played on a realigned tennis court with special tennis balls that emit sound. Raised tactile lines are used as navigational markers to assist the visually impaired athletes to recognise their position on the court. Players use their heightened sense of hearing and develop their spatial awareness to track and hit the Blind Tennis balls. Athletes are classified using Paralympic sight classifications: B1, B2 and B3. B1 players have no vision or no functional vision. B2 and B3 players have a small amount of useful sight within a reduced field of vision. This incredibly skillful form of tennis is one of the newest sports in Ireland. It was launched by President Michael D Higgins a year ago at Mayfest, the annual Sports weekend organised by Vision Sports Ireland (VSI). Rahim Nazarali, the Sports Development Officer of VSI, describes it as the fastest ever growing sport for the blind community in Ireland. Liam O’Donohoe of Tennis Ireland said “This is an important step forward for tennis in Ireland. The hard work in recent months by the players, coaches and the club volunteers who support the team through the Enjoy Tennis Programme has created this opportunity and we wish them every success in Spain”. Updates from Alicante will be available on the Tennis Ireland (www.tennisireland.ie) and Vision Sports Ireland (www.visionsports.ie) websites. 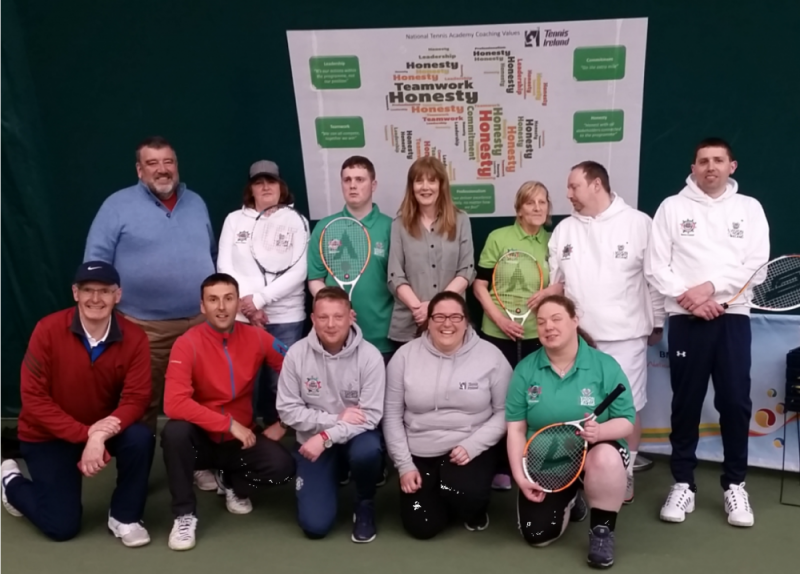 Blind Tennis in Ireland is currently based in several tennis clubs in Dublin and Belfast and will shortly expand to Galway, Sligo, Navan and Cork. The growth and development of the sport has been possible through significant funding support from Sport Ireland.